Columbia University in the City of New York, Athletics Department - Columbia University was founded in 1754 and fields 24 co-ed, men’s, and women’s teams. Women’s teams are cooperatively organized with the affiliated Barnard College. All Columbia teams compete at the Division I level in the National Collegiate Athletic Association (NCAA). Columbia required an Outlook signature tool for their employees that could be rolled out across 24 sports plus administration & athletics development. Their Outlook signature needs were quite complex and included optional photo uploads for football coaches, individual Facebook, Twitter and Instagram for some, but not all, sports, seasonal links to training camps, a donation button linked to each individual sport, and an option to include the Ivy League Digital Network icon. 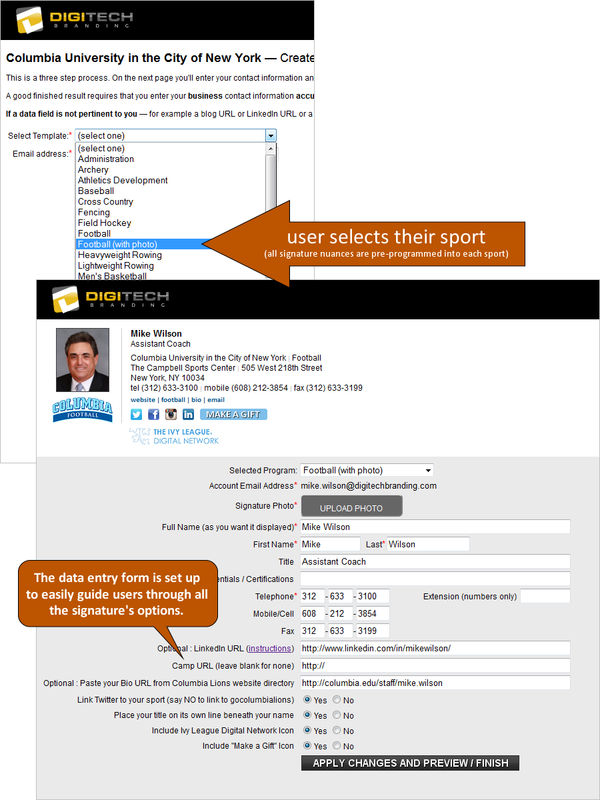 Provide a uniform Outlook signature to about 175 coaches, trainers and staff. Keep the program simple to use but provide customization to reliably meet the various needs of the 24 sports plus administration & athletics development. Streamline the ongoing deployment of the Outlook signature to current and future employees. A DigiTechBRANDING “text-and-logo” Outlook signature program offering two variations. 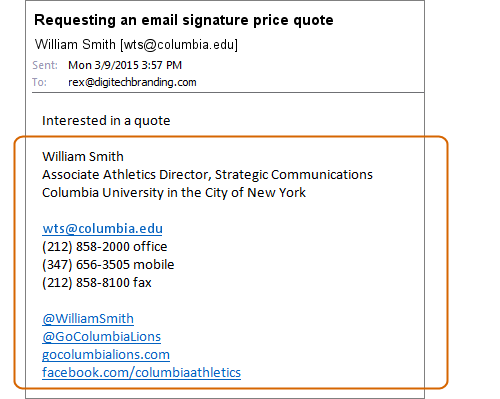 Following their initial review of our Outlook signature service, Columbia University Athletics Department requested, and we provided, a formal proposal addressing price, technical requirements, security issues, and references. Shortly thereafter, they formally engaged us to complete their Outlook signature project. Can there be two mobile numbers? Can you include extra website links for coaches’ recruiting? Can each coach/individual have their twitter handle appear? Can we add a small button for the Ivy League Digital Network? Is it possible to have mailing addresses show up in text on the signature? Can there be a link for camps that the coaches can activate seasonally, by typing in their camp html address? Please remove the vCard and map links from our signatures. Our development office wants us to add a “Make a Gift” link for coaches and administrators (using team-specific URL’s). Please make this an opt-out feature for all signatures. Our football coaches would like to include their photo - can you make a special version for just football? One of our goals is to make this work on all devices/platforms. How usable is it for Mac Mail, etc.? We answered their questions and implemented the requested changes within 24 hours of each request, allowing Columbia University Athletics Department to proceed with the final design process in an efficient and fluid manner. After roughly three weeks their Outlook signature program was ready to roll-out. Everything about the design of the program was focused on keeping the user experience super-easy. Columbia University Athletics Department personnel and the DigiTechBRANDING team worked collaboratively over a period of about a month. The effort was neither trivial nor overwhelming. Together we made continuous, steady, progress that resulted in the department-wide deployment of a very well executed Outlook signature program. DigiTechBRANDING has a customer that we’re proud to support, and Columbia University Athletics Department has the assurance of continued prompt attention to their Outlook signature program on an as-needed basis going forward.